Hyundai has enhanced its compact CUV with more tech and safety kit, but drops 1.6L turbo for big-bore four. Hyundai on Wednesday revealed a freshly reworked 2019 Tucson compact CUV just three years after the third-generation model went on sale. Shown at the 2018 New York Auto Show, the updated Tucson gets new front and rear design elements, a redesigned dash, additional safety kit, and expanded infotainment and convenience offerings to make it a more competitive player in one of America's fastest growing automotive segments. New wheels and a refined lineup of engines also join Tucson for 2019. 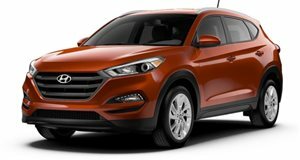 The 2019 Hyundai Tucson starts with a new cascading grille to better bring it visually in harmony with the all-new Santa Fe. It's bookended by slightly reshaped headlamps with daytime running lights. At the rear, Tucson wears new taillights and a redesigned exhaust finisher SEL and up models. As this is just a refresh, the 2019 update doesn't change the Tucson's overall silhouette, but it does bring redesigned 17- and 19-inch wheels along with a new 18-inch wheel option. A revised 2.0-liter four-cylinder will provide motivation on Value and SE-trimmed Tucsons, while the 1.6-liter turbo engine has been replaced by a 2.4-liter naturally aspirated four-cylinder on SEL, Sport, and Limited models. Both engines are mated to a six-speed automatic transmission. Hyundai executed most of the 2019 Tucson's interior changes up front, where it features a reworked dash, rearview mirror, instrument cluster, and new leather seats. The standard 7-inch infotainment system now comes with Apple CarPlay and Android Auto. Also, starting with the Value trim, Hyundai will bundle complimentary Blue Link Connected Car services for three years. SEL and up trims provide second-row passengers access to a USB port, while Limited models add a Qi wireless charging pad for the newest smartphones. Bulking up the Tucson's safety suite, Hyundai has made Forward Collision-Avoidance, Lane Keeping, and an electronic parking brake standard kit. Surround-view monitor, high-beam assist, rain-sensing wipers, smart cruise control with stop-and-go, and driver attention warning are options. The 2019 Hyundai Tucson will arrive later this year in Value, SE, SEL, Sport, and Limited trims. Hyundai did not disclose pricing details.